Life in the Boomer Lane has a GPS in her car. She got it because there is no GPS in her head. There is not even a G. There is nothing in whatever spot is supposed to hold some sense of direction. She would like to think that space is taken up by impeccable taste. But impeccable taste has never gotten her from Point A to Point B. She has many stories to tell about what happens to her when she tries to get from Point A to Point B without the aid of a GPS, a gas station attendant, a random person on the street, or a cell phone. Sometimes, all four items are utilized. The system her GPS uses is the same as the one Mapquest uses. This involves some kind of satellite up in space that knows where she is and will guide her to where she wants to go. There is allegedly something else up there that does exactly the same thing, but the GPS Sattellite doesn’t have a lot of churches devoted to it like the other one. The Lady Who Lives in Her GPS is very nice, but, like the people on the Technical Support Desk who she calls regularly, she sometimes loses patience with LBL. If LBL ignores her, she will issue the same exact instruction is a louder voice. LBL is not making this up. She will do it a third time (even louder). If LBL is still defying her, she will go silent on LBL. To LBL’s knowledge, she have the only passive aggressive GPS Person she knows of. She will only resume talking to LBL if LBL apologizes. A friend of LBL’s has a man in his GPS, a man with an English accent. He isn’t passive aggressive at all. GPS Lady will often tell LBL to make a right turn and then, after she does, she will tell her to make a U turn. She will ask LBL to make left turns on big, interstate highways. She will issue a scary warning like “Move to the left to avoid the area closed to vehicular traffic” when there is nothing ahead but the road and cars and everything seems to be just hunky dory (LBL have always wanted to write the phrase “hunky dory.” Thanks for reading it.). The first time GPS Lady did that, LBL spent about ten minutes trying to find a closed lane but couldn’t. And lastly, she will chirp “You have arrived!” when LBL is still en route. LBL is afraid to tell her she haven’t technically arrived because she feels like GPS Lady is doing the best she can do and LBL don’t want to let her down. For now, GPS Lady is what (who) LBL has and she am committed to her, until something better comes along (Don’t tell her LBL said that, please). She will await the next technological innovation from the Folks Who Bring Us Technological Innovations Faster Than We Can Learn To Use Them and she will jump on it. For now, she will use GPS Lady and all the other aids at her disposal. Her trump card is always that she (LBL) is a kind, inoffensive, obviously older woman who she believes anyone would want to help. Oh, yes, she also have impeccable taste. That should count for something. I think you and Jim have the same GPS person! Ours doesn’t know where we live…if we stopped where it told us to, we’d drive into the river! It has also directed us to “continue” on a dead end street with a 12-foot fence at the end (that fence has been there for at least 25 years – it’s an air force base!). Jim’s one of those techie guys who has to have every new toy going…I’m sure if there’s an improvement out there, he’ll find it! Glad you enjoyed the post. I have had so many mishaps with the GPS, I am seriously convinced it is screwing around with me. Someday they will find a poltergeist in the sattelite and all will be revealed. Probably the same poltergeist that put that darn extra “t” in satelite. Well having an english accent we always have time for “t”. Funny! GPS came with my new phone, and it hasn’t steered me wrong so far, but I’ve heard too many stories of people driving into lakes to trust it completely. As for screwy directions, once, I followed Google’s turn-by-turn directions and ended up circling some random hotel before getting back on the main highway. My GPS speaks an entirely different language- or and she yells at me when I somehow feel that my turn is the better turn! Why are gps’ always irate women? I think it should have a Berry White voice. This is so true! My GPS person is a b–ch! I even gave her an english accent to hopefully lower the angry tone, but this only made her sound like a classier b–ch! I love how she tells me to turn about 5 seconds after I have passed the turn and I swear she says “recalculating” in a way that puts the blame on me…what the hell! Mine also says “recalculating” like she actually means, “recalculating, you moron”. My husband and I now use the term to each other in the same tone when we do something wrong or silly. Haha, your post made me smile 🙂 I know how you feel about direction; I sometimes get lost in houses I don’t know well. The someone else up there apparently didn’t think I required a basic sense of direction. First of all, I want you to know that it is incredibly hard to laugh silently and inconspicuously at my desk! Your post cracked me up, I can relate so so much! Our GPS is on my husband’s Blackberry and she’s very pushy and wrong a lot. He gets huffy with me when I ignore Miss GPS and do my own thing and then I scoff at her when I’m right! Technology is seriously a love/hate relationship! Thank you for your post and congrats on being chosen for Freshly Pressed! I look forward to reading more of your stories! Your post was funny. I’d like to link to your site. I’m happy to have you link to mine! LOL thanks for the chuckles! Being one who is too directionally challenged to find my way out of paper bag, laying open on its side, I feel for you. GPS is not something I’ve tried yet…. Cute post. My GPS name is “Fred.” Fred is is very helpful unless I have to go somewhere in a hurry or if I have an urgent meeting somewhere. On occassion, Fred gets lost but generally he is great and a good friend. I find that if I offer Fred cookies or a snack, he seems to be more helpful and I get to my destination quicker. hilarious post. I can’t believe she yells at you and then gives you the silent treatment. Totally possessed!! So funny! My friend has a TomTom GPS, and we were in Pennsylvania once and it told us to turn right and drive onto a golf course. The same GPS had us get lost and we ended up in some sort of back-woods, dirt road situation. It was crazy. This is a great post and the story of my life. I enjoyed it and I am going to share it. Be glad that you don’t live in NJ, the jug handle throws in another wrench. Like getting off the road you were traveling on just to go through the jug handle and continue on in the same direction. Ah, I remember the jug handles from visiting friends in New Jersey. I grew up in Philly. I don’t know if you knew who Bill Handleman was (journalist with the Asbury Pask Press). He was a dear friend and I wrote a post about him. He will be missed by many. I did know who he was. Many people were saddened by his passing and I’m sorry for your loss. I will read your post. I knew the Jersey jug handles were getting too long when they started putting rest stops on them. Great post. Mine had me driving around in circles looking for a Borders that was across the highway. Of course, I was in Atlanta at the time so maybe the GPS was annoyed with all the traffic and getting even with me. Who knows? If this is for Baby Boomer, I either have an “old soul” at 32… Or we should all face it… The younger generations CAN RELATE! What a great read! Very funny! My GPS gets very aggitated with me as well and I hear it in her voice when I stear away from her direction and she whips at me and says, “recalculating.” There’s an underlying tone that is impossible to ignore. Very Cute!! Sorry for your troubles, though they sound kind of fun! Congrats on being Freshly Pressed!! The post is very funny; I love all the equally funny responses you have gotten as well. I for one would have trouble with a GPS because I seem to have this knee-jerk reaction to add extra comments to the ever polite *recalculating* sheila voice. I’m not sure why they bring that out in me…. Also, congratulations on being featured on ‘Freshly Pressed’!! I KNOW that we got the same GPS lady! I have had screaming matches with her in my car when she starts in with “right turn…. (pause)…ahead…” when we are in the middle of freakin nowhere with not a road in sight…..
My GPS once told me to turn left. On the freeway. No joke. While traveling through Pittsburgh with that same Lady in the GPS, she had difficulty pronouncing, “Duquesne” — The locals call it, Du-cane. But she called it, “Do-ques-knee,” which made us laugh so hard we almost drove into a retaining wall. Please tell me that you subscribe to Dictionary.com’s Word of the Day, which today is hunky dory. My husband has often told me, “you have many fine qualities, but your sense of direction isn’t one of them.” It drives him crazy that I can’t find my way back from two turns if the road twists and turns in between those turns. My internal compass is vestigial. That said, I have to admit that my GPS is not the passive-aggressive one – I am. If I know a “better” way, I take great delight in thwarting her. Let her sound peeved. What am I paying her for? Let her do a little extra work! Oh miss Garmin Nuvi, you sound adorable. I agree. We need a better GPS. I think I recently had a run-in with your GPS lady. She was occupying the front seat of a friend’s car. She also took us on a long road trip to nowhere in particular miles away from our destination. Can I just say that the person who got us home was not the lady in front with the posh accent, but the lady in the back seat (yours truly)…who had a MAP. Amazing post. Kept me entertained as I read it. Congrats for being on Freshly Pressed today. See my blog Tech Right Now too. You might like it. Your post made me laugh- so well written!!!! Really enjoyed reading some of your posts. I’ve written about the perils of the Eyes in the Sky a couple of times in my blog– jhalbrook@wordpress.com. The last post was when one was stolen, The Smash and Grab Man, but yours is funnier. Love your writing. Brilliant post! It absolutely had my in stitches in the office. I totally know where you are coming from. We used to have a Sharon Osbourne voice on our GPS and she would get irate when we didn’t follow her directions. It was hilarious though not very helpful when she got us lost. I especially like the “your GPS is wrong” picture at the bottom. I am so not a GPS person and you are all amusing to watch. Kind of like a viewing a (relatively) harmless cult from the outside. That picture at the bottom says it all to me. My aunt was the first person I knew to imagine a personality in the GPS voice. I will never get a GPS, mostly because I don’t need one, but also because it’s funny that otherwise capable adults are so completely helpless in the face of maps and directions that they have to rely on GPS and then get so frustrated when it’s “wrong.” What have we evolved to? Hilarious. Your post is food for such thought. Thanks. I think that people became addicted to technology, sometimes even more than common sense.. I hope that someday we can find smarter guides than the existing GPS technology for everyday use.. I think that people became addicted to technology, sometimes even more than common sense.. I hope that we can find smarter guides than the existing GPS technology for everyday use..
Haha. Mine tells me to turn left when the picture shows turn right and it’s actually the right that’s right. She’s just trying to trick me. I can relate to a lot of things you’ve written. My GPS always says random things at random timing. I’d love to see other articles written by you. Do you know those GPS voices are real people? I was chatting to one voice over artist who was hired to do them, and it took over 50 hours of recording just so she could get you lost. I’m blown away. I thought they were computer generated. I could do that for a living! I love to get people lost! My friend’s GPS reminds me that there’s a little bit of crazy in everyone…when the screen starts twirling around, or like you said, tells me to turn in the middle of the highway, I talk back and actually feel like there’s another person in the car with me…in the end, her voice becomes silent and I arrive at my destination…only to have a destination dialogue the next time my point B is a new place to be, see, or take me. Surely very funny and fun writing…love it so much….please write for more…. Thanks for reading! 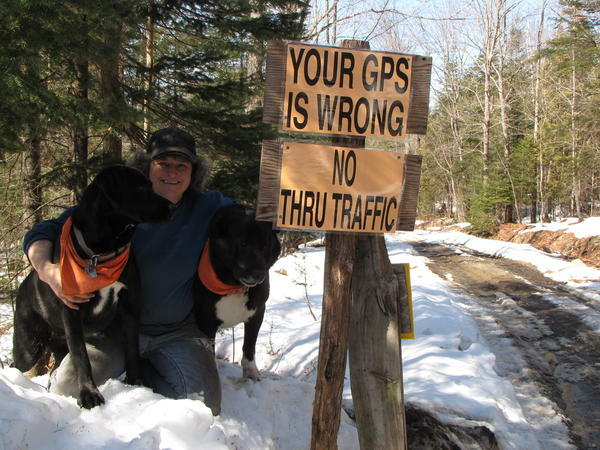 I love that everyone can relate to adventures with the GPS! This a lesson to every one that you can’t rely on a GPS. I do not know whether it’s just me or if perhaps everybody else experiencing issues with your site. It appears as if some of the written text in your content are running off the screen. Can somebody else please comment and let me know if this is happening to them too? This may be a issue with my browser because I’ve had this happen before.